It was an ugly scene in Enugu State, South-eastern part of Nigeria when two angry pleasure workers clashed over a customer. Two commercial s*x workers had to slug it out in public for all to see after a disagreement over a male client. 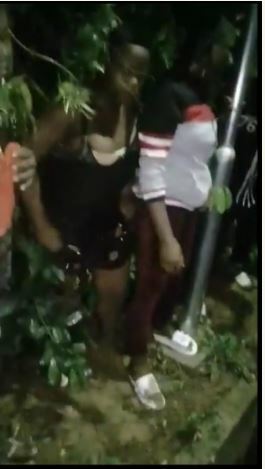 The incident which happened yesterday night in Enugu, saw the two ladies engage each other in ‘clash of the Titans’ as they ripped off their wears in the course of the fight. The fight was said to have started after a quarrel by the ladies over a male client, in a report by an eyewitness. While the ladies fought, passersby who were apparently thrilled by the brawl, gathered in their numbers and did little to stop them as they recorded the embarrassing scene. 0 Response to "Two Prostitutes Fight Publicly In Enugu Over Male Customer (Photos+Video)"